70's Bollywood movies are some of our group's favorite ones to watch. The tantalizing tunes, fantastic fashions, kaleidoscope of colors and symphony of stars make them a great choice for group viewing. When one of these movies is hitting on all cylinders the result is escapism in it's finest form as well as a treat for the senses. The filmmakers made these movies with reckless abandon and created some priceless Bollyweed along the way (meaning they were either smoking something while it was being made or you need to in order to fully enjoy them). But what happens when the excesses go to far? When the aforementioned filmmaker puts together all the elements of a classic masala movie but doesn't get the ingredients in quite right? Well what you get is an almost good movie that instead serves notice that sometimes more is indeed less. One of the last directorial ventures by the iconic Nasir Hussain will best be remembered for the fact that I was more confused by the plot line of this movie than by any other movie in recent history. And yes, I know I have said that plot is the least important part of any 70's Bollywood masala movie but it needs to at least be there for god's sake. Rajesh's (Rishi Kapoor) father, a rich business man winds up his business in Africa and starts off for India with diamonds worth Rupees twenty five crores. The diamonds were hidden in a leather belt with him when he died at Beirut Airport(!). Before dying, he gave the belt to one Mr. Kishorilal and requested him to take his life's savings to his son Rajesh. But Rajesh does not get the diamonds. The diamond belt mysteriously finds it's way into a bicycle tool box belonging to Sanjay (Tariq) who is not even aware of it. In his search for the diamonds Rajesh comes across Kaajal (Kaajal Kiran), Kishorilal's only daughter. Kaajal in childhood was betrothed to Sanjay but in a cruel twist of fate was separated from him. The two young men, Rajesh & Sanjay, create such a tremendous emotional dilemma in Kaajal's life that she is unable to decide which one will be the right choice. But a more explosive situation is created when Saudagar Singh (Amjad Khan), an international criminal, turns Rajesh, Sanjay & Kaajal into pawns. Saudagar Singh has pursued the diamonds from Africa to India. Who gets the diamonds eventually - Saudagar or Sanjay? Who saves Kaajal's life and wins her love - Rajesh or Sanjay? 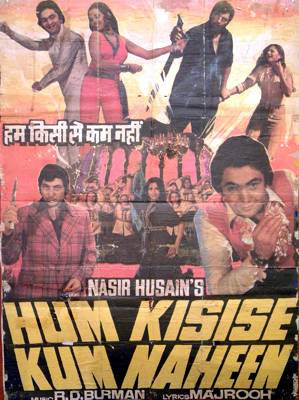 This is the fabulous and colourful story of romance and intrigue of 'Hum Kisise Kum Nahin'! 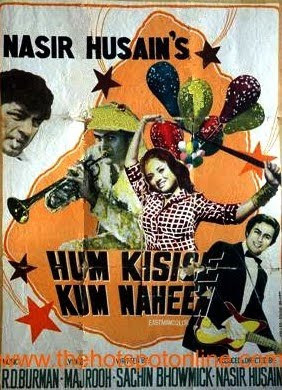 What was most maddening about this movie is that Nasir Husain chose NOT to focus on two of the most charismatic stars in Bollywood (Rishi & Zeenat Aman - who is not even mentioned in the plot synopsis) but instead handed it over to two unknowns who just did not have the gravitas to carry such a bloated film. Granted, Rishi & Zeenat may have not been able to either but at least we would have had them in the majority of the movie and perhaps that would have been enough. But it wasn't meant to be and the movie just didn't do it for me. It went on to win several Filmfare Awards including two for Rafi for playback singing, one for the art direction and one for the cinematography. This movie does have something amazing going for it though - R.D. Burman's chart topping and jaw dropping soundtrack. Nasir Husain demanded that Kishore & Rafi get an equal number of songs and in this round it was Rafi that came out the clear winner. The song for today is sung by Asha Bhonsle (aka Mrs R.D. Burman) & Rafiji and is the title track as well as quite possibly the greatest quwalli EVER in the history of Bollywood. Zeenat may not be the star of the movie but she completely takes it over during her rendition of it's title track - I dare you not to get goosebumps when Asha starts singing, it's that good. Followed by a completely unnecessary plot detail (so Beirut was at one time considered exotic? Interesting). We then learn a little about Rajesh. That he is a great dancer and has AWESOME fashion sense. This guy looks nefarious but again, a complete mismanagement of star power by NOT using Amjad Khan in more of the movie. The only saving grace from the goonda camp. These are Kaajal's bodyguards and I am still not sure whether they were meant to be scary or funny - they turned out to be scarily funny (like four Curlys from the Three Stooges). Flashback to a scene with these lovely two urchins singing the second of three signature songs from the movie, 'Kya Hua Tera Vaada?'. During this whole scene the two fathers agree that the kids will indeed be married someday but instead they get separated by the cruel hands of fate. Father & son track down the lovely Kaajal's whereabouts and remind her dad of the 'vaada' he made years ago regarding their future. I just love the turban on Shri Ram Lagoo here. Anyway, they are shooed away by Kaajal's dad because he has become stupid rich over the years and they just aren't a good match anymore. Boo! OK - this is where the fuzziness really begins. Somehow Sanjay starts working for Rajesh (as his manager) and Kaajal is sent to meet Rajesh for a possible 'rishtaa'. Sanjay sees Kaajal and pretends to be Rajesh with the four Curlys standing guard behind her. Kaajal tells Sanjay that she can't go anywhere without her goons so they decide to ditch them for a day out on the town. This is the goon's 'which way did they go George' look. Quite possibly my 2nd favorite scene in the movie. While out and about with Sanjay (having successfully ditched the Curlys) Kaajal gets her hands on some balloons and floats away during 'Yeh Ladka Hai Allah'. Colors colors colors! The real Rajesh (aka Rishi Kapoor) shows up while Sanjay does his best 'Who Me?' look. Somehow during all this I think Sanjay has figured out that Kaajal is his childhood sweetheart, still not sure when that exactly happened though. Rajesh tries his hand at wooing Kaajal since he was the one who was supposed to do it in the first place and does a splendid job of it. He is freaking Rishi Kapoor after all! To get to the aforementioned programme, Rajesh needs to do something about the Curlys. He puts something in their chai that doesn't quite agree with them, hilarity ensues! Is it? Could it be? I think it is... DANCE OFF 70'S SHTYLE!!!!!!!! I got my own backup band, my nickname is Chintu and I got yet ANOTHER amazing white outfit to do battle with you in, what you got to say now playah? Rajesh wins a Kaajal for his efforts, was there any doubt to the winner of this one? Not trying to tell you how to do your job Mr. Husain and granted, I am extremely thankful that you decided to put Zeenat into the movie at this point but what the hell happened? I thought Rajesh just won over Kaajal but out of nowhere you magically add Sunita (Zeenat Aman in an uncredited role) to the mix? So confused but can't... stop... watching. Immediately after the above scene (really) we find out that Sunita has told Rajesh (for unknown reasons) that she can't marry him and so begins the signature scene of the movie with a quwalli for the ages, 'Hum Kisise Kum Nahin'. 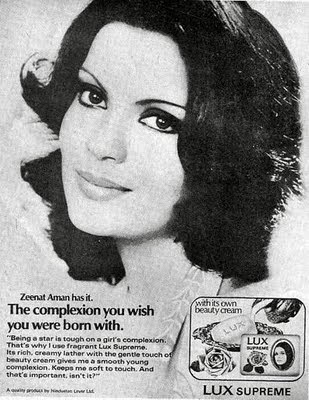 Obligatory shot of Zeenat looking both pained and drop dead gorgeous. Rajesh is basically calling her out on her sudden about face at their blossoming love affair. She takes the bait and then proceeds to take over the move in less than two minutes of screen time (with a little help from Asha Bhonsle). OK, so by this point I am completely lost and have no idea why Rajesh called Kaajal out for a mountainside picnic when it's clear that Sunita has reciprocated his feelings for her. I just included this shot for the fabulous brown ALL LEATHER SUIT that Rajesh is sporting. Oh, and Sunita disappears, again. Rajesh takes Kaajal out for dinner and look who just happens to be the entertainment for the evening - it's Sanjay (in a most unfortunate headband)! And it's signature song number three of the movie - the one that the two childhood sweethearts sang to eachother wayyyyyyyyyyyyyy back in the beginning of the movie. Except this time Sanjay is ASKING Kaajal, "what did happen to your promise?". It all comes together for Kaajal and she is a bit overwhelmed at it all. Somehow everyone figures out who eachother is and Eric finally gets an answer to his question about what happened to those diamonds. Unfortunately, no one else but him cares about them at this point. A really really really REALLY long gun battle erupts over the diamonds even though it's clear that no one was around for the big reveal. I love this shot of the gun toting goondas coming after our band of misfits. Why? Because they are wearing matching outfits with matching leather vests to boot, bravo costume designer, bravo. Now that Rajesh has figured out that Sanjay and Kaajal were meant to be he writes her a letter telling her so. After writing the letter he decides to immediately leave town. On his way OUT of town he runs into Sanjay coming back INTO town. After reuniting our two doomed lovers (and his dad) the too cute couple ask Rajesh about any parting words of wisdom. I swear that Sanjay is wearing more makeup than Kaajal here but that killer scarf makes up for it. Can't say I've seen this, but thanks to your fabulous breakdown and screen caps I feel like I have. I might watch this just for the dance off! Have you notice how mostly all 70's movies revolved around getting your hands on the "daimonds"? lol! this movie did have too many twists but the songs made up for it! I liked this film just for all the eye candy (costumes and 70s ishtyle) and that lovely qawwali. Zeenat was only a "guest appearance" no doubt for her pizzazz factor---Nasir was trying (again) to launch poor Tariq (his son) who just never quite made it (despite being in Yaadon Ki Baaraat). He just had no chance against Rishi though :) Made for great confusion about who the actual hero was supposed to be! BD - you aren't the only one who liked it as it was one of the biggest hits in Indian cinema. Just didn't do it for me but I agree that the songs & colours were the best part of the movie. I corrected my post but what I meant about his last film was that it was his last good film (in my opinion of course). Shell - Thanks for the kind words and I do highly recommend you get this to watch all the songs and of course that fabulous dance off. Nafisa - Great point about the diamonds :) Twists were a plenty but were a unnecessary as well. Songs will last forever though. Wonderful! Thanks for bringing it all back so clearly.